The Dell XPS 13 2015: bezels are bad, ok? With the rumoured launch of Intel's Broadwell-U CPUs at CES 2015, it was highly likely that laptops featuring slim and portable designs would emerge — but the systems that strode the red carpet under the Las Vegas sky surpassed my already high expectations. I'm a sucker for a stylish ultraportable, and while the gains in battery life brought by Intel's fourth-generation Haswell processor made a huge difference to on-the-go productivity, for me, the slim and light designs made possible by Broadwell make the next generation of systems far more exciting. Intel Broadwell vs Haswell: What's new in Intel CPUs? Take Dell's new XPS 13, for example. The previous incarnation of the company's Ultrabook was hardly a monster, but its successor looks cut from an altogether different, silkier cloth. 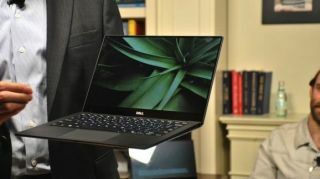 The 11-inch notebook's aluminium bezel is so thin that it's virtually invisible, and Dell has managed to cram a 13.3-inch display into a frame the size of what you would typically find on a 11-inch laptop. As Juan Martinez notes in our hands on review, the XPS 13 2015 has an 11% larger display than the one on the 13-inch MacBook Air, despite the laptop being 23% smaller than Apple's lighter MacBook. MacBook Air fans have long laboured over the decision of whether to plump for the portability of Apple's 11-inch model, or the screen real-estate of the 13-inch version. It's a quandary that the latest generation of machines is looking to eliminate, and Apple is said to be taking a similar approach to design with its rumoured Retina MacBook Air. Elsewhere, CES threw up a surprise in the form of the Lenovo LaVie Z, which the company claims is the "world's lightest" 13-inch laptop at just 1.72 pounds. Broadwell-equipped, it sports a lithium-magnesium alloy case and uses a directly bonded touch panel made of special film rather than glass to achieve its alleged record-breaking weight. The lightest laptop in the world? As Joe Osborne said in our hands on review, "Holding it with one hand feels like you're holding an iPad ... only this is a Broadwell Intel Core i5-packing laptop running full Windows behind a 13.3-inch, 1920 x 1,080 IGZO panel." I'll take two. The Yoga maker also outed the HZ750, which it claims is the world's lightest 13-inch convertible notebook at 2.04lbs. Broadwell's thinspiration wasn't restricted to "regular" laptops and convertibles on the first day of CES: Origin's beefy EON15-X gaming laptop measures just 3.5 cm thick, which isn't mind-blowing until you consider that that it houses desktop-series Intel Core i7 4790K under the hood. That's right: the EON15-X is a portable gaming tank that crams desktop innards (GPU aside) into a chassis 1 cm thicker than a MacBook Pro. Workstations, another category of traditionally chunky product, saw similar design wins on the back of Intel's new CPU. According to HP, its new enterprise-facing ZBook 14 is one of the lightest 14-inch workstations around, tipping the scales at 3.77lb. That falls below the approximate average weight of a workstation, which lies closer to 5lbs, while providing serious graphics horsepower in the form of high-end AMD FirePro graphics. It's a good sign that Broadwell isn't seeing PC makers sacrifice power to make their systems thinner and lighter. Lenovo's Yoga 3 Pro, which uses Intel's mobile Core M (or Broadwell-Y) chip, was surprisingly underpowered and signalled a red flag for the future of the fifth-generation chip. With new machines flaunting desirable designs from the outset, here's hoping that they'll perform where it matters and arrive with a heady dose of brawn in addition to beauty.